Comments: Palmate multistem small palm native to China. Mature height to 12 feet on 1 inch diameter stems. Stems look like bamboo canes which gives this species the alternate common name of Bamboo palm. 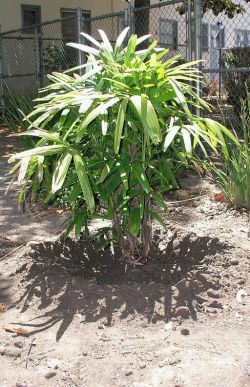 This palm was planted as a memorial to Debra Abbey custodian at Niles Elementary School before her untimely death.